This is another scenario by Roland. The CinCs will not be awarded extra points for cuteness. 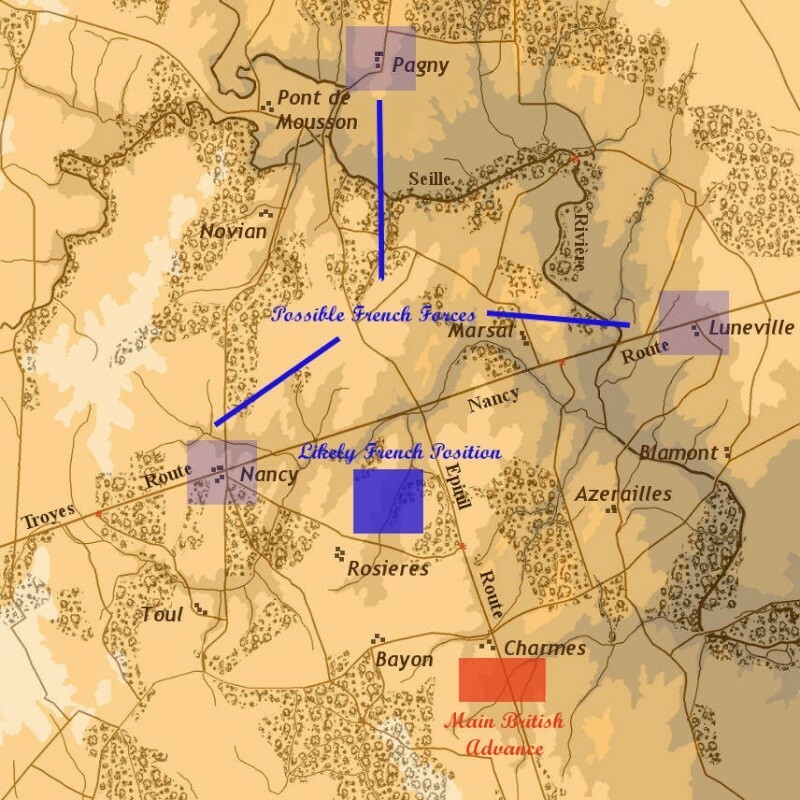 The main armies of Napoleon and Wellington are deploying for battle a few miles east of Luneville. The corps of Vandamme and the Prince of Orange are needed by their respective armies to swing the chances for victory. Not surprisingly, the enemy corps must not be allowed to join in the main battle. 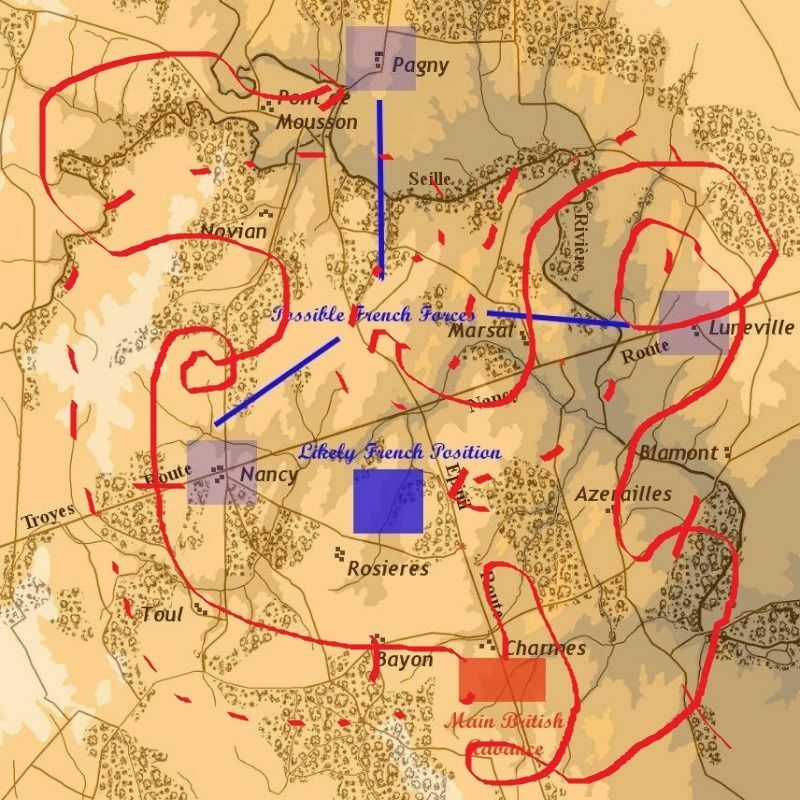 This 3 hour battle will take place on the Manassas map. The 3 standard mods will be needed. As usual, commanders cannot scout more than 200-250 yd. in front of their troops. Troops the reach the eastern edge of the map along the Nancy Route are said to have exited the map. They may not be attacked and may not rejoin the fighting in the west. No idea if I can make this one. I'm away at a hotel on business for 3 nights Fri/Sat/Sun. The place has internet access and I'm taking my PC but it'll be a wireless connection so I could be of unreliable stability. Hey, Mark, I've got this one for you buddy. Actually... make some of those lines green, yellow and maybe some violet-coloured hints and express things in at least 3 phases and I'd buy that. I thought Galaxy was writing his attack plan in gibberish. I suppose it comes as no surprise that no one has stepped up to volunteer for CinC. We also need a minimum of 8 players for this battle. So far only 5 say they can definitely play. I am able to tomorrow, just posted it on the Doodle. Given that we only have 4 definite and 3 possibles for the today, I suggest we play at 21:00 BST. If we have 8 or more players we'll play the scenario. Otherwise, I'll throw something together based on how many show up. OK, for me it is even better. Rainy season showed up early had a T-Storm. Hope the scenario went well. if I was really cheaky I would start stating things like: "we won because of MY superior leadership", "MY battleplan was simply invincible", "MY troops performed heroically..."
". . . though I am unsure what he really did the entire fight." I missed to have fighting on my side some commanders from the "Plan XVII War College", capable of getting the best of the innate offensive skills and character of French soldiers, French élan is unstoppable and there are just two words in our dictionary "En Avant!". what time are we starting tonight? If Pepe plays, we'll start at 20:00BST. If not let's start at 19:30BST. Then we'll meet at 20:00 BST, gentlemen.